Fresh air. Sun-kissed swims. Songs sung at the top of young lungs. The indescribable thrill of learning something new. Friendships that last long after the rays of summer have begun to fade. And, counselors that kids can look up to, who boost confidence and treat your child like he or she’s part of the family. Summer camp leaves you with indelible memories, even now, as an adult. So it only makes sense that you want the same for your child. That’s why choosing well is so important. Experienced, nurturing staff hand-chosen for their love of children and joy for teaching. Programs catered to the interests and needs of kids at different ages and developmental stages. A focus on positive relationships and creating friendships that last a lifetime. A safe, wholesome environment where kids can be just kids. Fun, creative activities that also develop life-long skills. A strong sense of community—many campers return year after year. An emphasis on quality in everything we do, from flawlessly maintaining our facilities to providing excellent customer service. 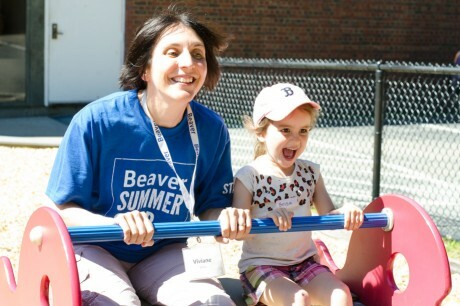 As a first time parent with a beaver camper I can’t say enough good things! My daughter is busy and engaged with super fun activities every day! I am always impressed with how smoothly everything seems to run and the up-beat all-hands-on-deck staff.